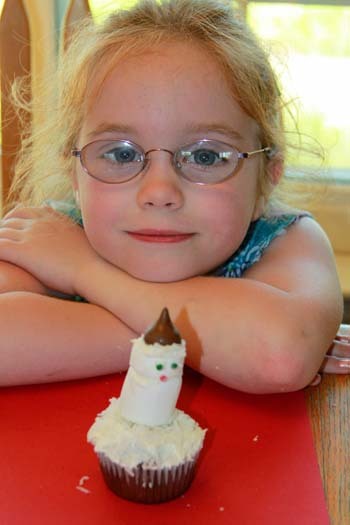 Here’s a fun Christmas baking project for kids. They’ll love creating these easy snowman cupcakes that only require a few extras to decorate and are simple enough to make that even younger kids can participate in the fun. Follow the directions on your favorite cake mix to create cupcakes. Bake and then allow them to cool. 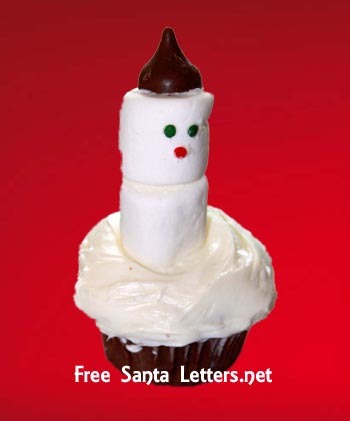 Now place one of the large marshmallows securely in the center of the cupcake to form the snowman’s body and spread a little frosting on top of it. Place a second marshmallow on top of the first one to make the head. Be sure there’s enough frosting between the two marshmallows to hold the second one securely in place. Now carefully spread a small amount of frosting on top of the second marshmallow and top it with a chocolate Hershey’s Kiss to create the hat. To complete your snowman cupcake, use a tiny bit of frosting on the back of some sugar sprinkles to create the eyes and nose. You can also use mini M&Ms or an edible color marker to make the face. Repeat until you’ve turned all of the cupcakes into festive Christmas snowmen. Then sit and enjoy!